Add the payment as a record in SellerCloud. Apply the payment to channel invoices with open balances. Verify that the payment was applied correctly. These are the payment-related steps in SellerCloud's Channel Invoice workflow. 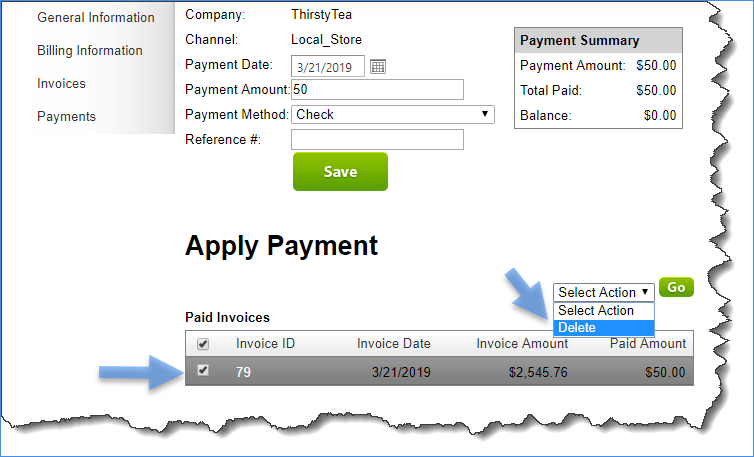 The Channel Invoice feature lets you create a channel invoice based on the shipped orders for a date range in SellerCloud, so you can reconcile the channel's invoice against SellerCloud data and apply the channel's payment to that invoice. 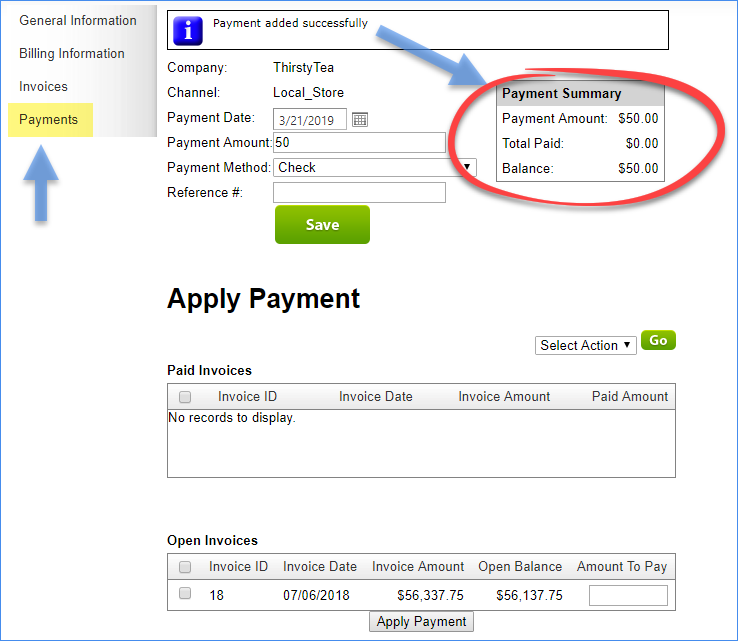 Prerequisite: Before you add/apply a channel payment, add the channel customer and create the channel invoice. Click Customers > Channel Customers > choose the channel customer's Display Name > Payments. This Channel Customer Payments page lists all payments that were already added. These payments may or may not have been applied to invoices yet. The Open Balance column will reflect the available amount. Reference # - Enter an optional reference to the payment method; for example, the check number if paid by check, etc. Click Save. The Payment Summary box on the Channel Payment page is populated with the payment. You can see this newly added payment at the top of the list on the Channel Customer Payments page by clicking Payments. Click the desired Payment ID. The Payment Summary box on the Channel Payment page shows the payment's details. Verify the correct balance of an applied payment by checking the Payment Summary. The balance will be either zero or the amount that is still available for you to apply to open invoices. If you applied payment to the entire balance of an open invoice - Verify the Paid Amount in the Paid Invoices grid. 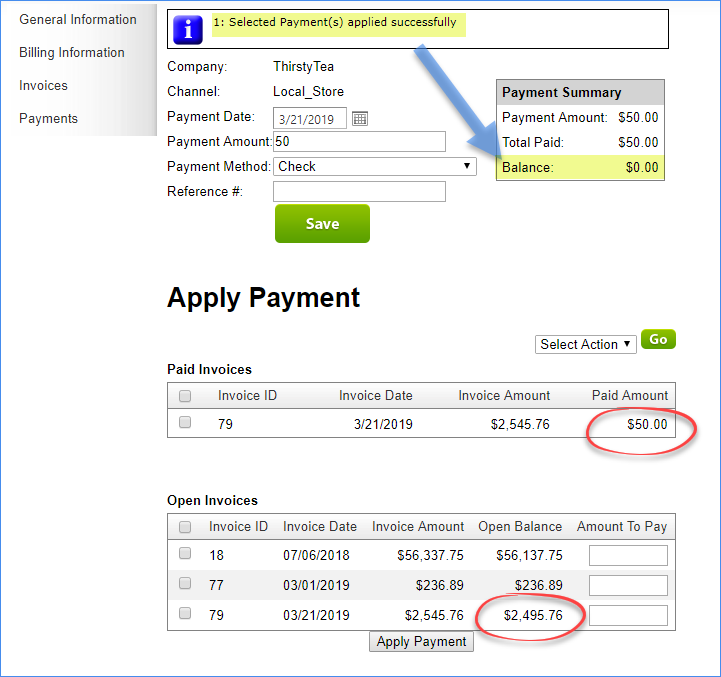 If you applied partial payment to an open invoice - Verify the Paid Amount in the Paid Invoices grid and the updated balance in the Open Invoices grid. Deleting a payment is a two-step process: Unapply payment from an invoice, and then delete the actual payment record. 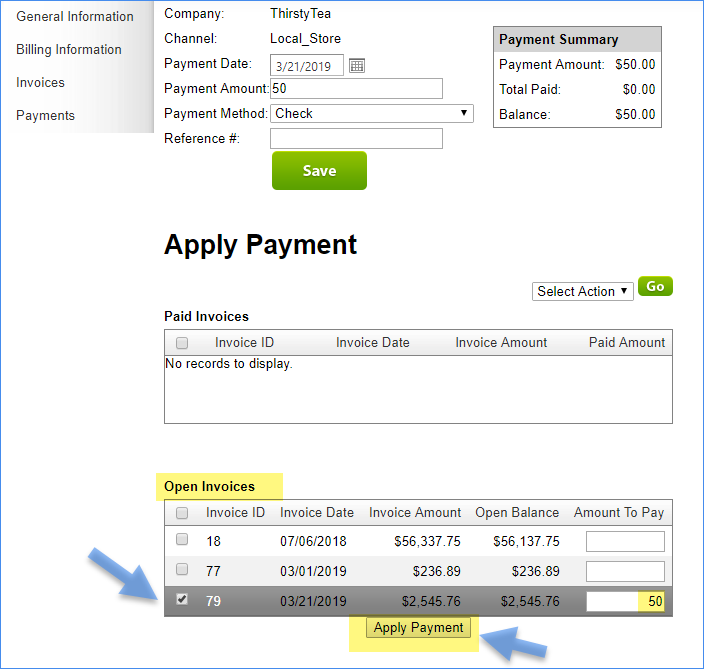 If you only want to update a payment amount, you can do that here in Step #2: Instead of selecting the payment ID, click to open the payment record, edit the Payment Amount field, and click Save. On the Channel Payment page > select the invoice in the Paid Invoices grid > click Action Menu >Delete > Go. The amount in the invoice's Open Balance will be updated. Go to Payments > select the payment in the Payments grid > click Action Menu > Delete > Go. You will be prompted to click OK if you want to delete the channel payment. The payment record will be removed from SellerCloud.